Whenever someone talks about Japanese cinema, an example of monster files, Godzilla is probably bound to come up at one point or another. As Mimi Honda, wife of Ishiro Honda said, "the first Japanese film to earn a lot of money overseas." Mushroom Cloud and Mushroom Men discusses the life, works, themes and inspirations of Ishiro Honda, the man who directed the original Godzilla move. However, for any works there is rarely any one individual that can really take all the credit for a film, but what better method than pointing out an individual, who can inspire others who are seeking to learn about a genre. Reading this book is for me is similar to reading an analysis of Hayao Miyazaki's animation works. Why am I even mentioning about Miyzaki, when this is a book on Honda? Simple, because there are some similarities between these two men that are worth mentioning, they are from the same generation, and in their lives, their works shape parts of an industry that is well known, and beloved by various fans around the world. There was also part mentioned in the book that struck a chord with me. The producer is often better known than the director, so this part reminds me of who is more responsible for success. Peter Brothers introduces names and roles that other people had, all the while still keeping on focus and analysis with Honda. This book is appropriate and a reading material must for Japanese film lovers, or for any student in the process of studying film creation. It is a handy reference for people to familiarize themselves with a very specific genre of movies that came out from a culture that is regarded to be a unique one. In early parts of the book there are general differences between western and eastern films discussed, especially in the style of monsters films. So then what is seen as the norm for parts of a King Kong film vs. Godzilla then? For the rest of the book, specific works of Honda is listed by year of release, detailed and analyzed in topics of special effects, historical significance, movie soundtrack, and cast. By the time reading this book is over, (this book can be used as a guide for movie rentals), the reader should then take the opportunity to go and seek borrowing the many films of Honda to watch. A new travel guide targeted at fans of Japanese science-fiction and fantasy movies has been released by Armand Vaquer, contributing writer for G-FAN magazine, called "The Monster Movie Fan's Guide To Japan." The guide is in magazine format and includes the locations shown in Japanese science-fiction and fantasy movies over the past 55 years. It will tell how to get to each location, where to stay and what tourist attractions are nearby. ""The Monster Movie Fan's Guide To Japan" is the first travel guide tailored to Japanese monster fans," said author Armand Vaquer. "There have been plenty of books about the movies, but nobody has ever put together a guide for people to go see the locations shown in the movies until now. This will be a useful tool in planning a Japan vacation and for tour operators who June want to arrange tours for Japanese monster fans." The guide is 52 pages long and will includes travel tips and articles on Japanese customs and immigration policies and information on currency exchange, weather and other topics. The Unauthorized Biography of "The Big G"
GODZILLA is... King of all monsters! Nature's radioactive revenge! The Big G! Bigger, badder, and more durable than Hollywood's greatest action heroes, Godzilla emerged from the mushroom cloud of an H-bomb test in 1954 to trample Tokyo. More than 40 years later, he reigns as the undisputed king of monsters, with legions of fans spanning several generations and countless international boundaries. Japan's Favorite Mon-Star is the first complete guide to the Godzilla legend published in North America. It is also the first totally unauthorized Godzilla book to be successfully published (legal challenges from Toho Co. Ltd. have previously snuffed out two others by Fantasma Books in 1996 and Quill Publishing in 1998). This book, the culmination of many years of in-depth research, includes production details on all 22 Godzilla movies produced by Toho in Japan between 1954 and 1995, plus several "unmade" features, plus the 1998 big-budget U.S. Godzilla remake by the makers of Independence Day (aka: Dean Devlin and cohorts). It dispels the myths and illuminates the mysteries of Japan's enigmatic mon-star, and is loaded with background information, trivia, and exclusive interviews with the people who created Godzilla - then and now. Interviewees and personal profiles include special effects director Teruyoshi Nakano, Godzilla suit actor Haruo Nakajima, composer Akira Ifukube and actors Yoshio Tsuchiya (MONSTER ZERO, DESTROY ALL MONSTERS) and Robert Dunham (MOTHRA, GODZILLA VS. MEGALON). With over 300 fact-filled pages and over 94 photos and illustrations, JAPAN'S FAVORITE MON-STAR is the biggest and best Godzilla book available, and the only one you'll need. A "behind-the-scenes" hero to anyone who's thrilled to giant monsters duking it out over Tokyo, Eiji Tsuburaya was the visual effects mastermind behind Godzilla, Ultraman, and numerous Japanese science fiction movies and TV shows beloved around the world. The first book on this legendary film figure in English, this highly visual biography details his fascinating life and career, featuring hundreds of film stills, posters, concept art, and delightful on-set photos of Tsuburaya prompting monsters to crush landmark buildings. A must-have for fans, this towering tribute also features profiles of Tsuburaya's film collaborators, details on his key films and shows (most available on DVD), and features on the enduring popularity of the characters he helped create. If you're a fan of Japanese monster movies, you owe it to yourself to have this amazing book. Although soul-less computer effects have come to dominate even the cheapest of Kaiju flicks today, the pioneering work of Tsuburaya remains unmatched for sheer "popcorn throwing goodness" and charm. 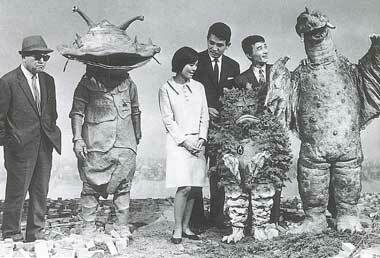 Below: Eiji Tsuburaya hanging out on the set with a few monster friends. We've seen what happens with giant monster movies when they're made by people who don't "get it". Dino De Laurentiis produced a remake of King Kong back in 1976. Boy, did he not get it. Peter Jackson remade Kong a little more recently. He got it. monster genre. It's even worse getting into a sub-genre of a genre. Such a genre is the Japanese Giant Monster genre (a.k.a. Kaiju). This genre is a law unto itself. Roland Emmerich and Dean Devlin made a Godzilla movie for Tri-Star pictures back in 1997. They had no feel for the Kaiju genre, (but at least they knew it) so they did the next best thing. They made a movie that was a send-up of American, giant radioactive monster movies from the fifties, and tried to pass it off as a kaiju film. The scheme almost worked. Kaiju films were inspired by American, fifties, fear-the-bomb films. They are similar. But die-hard fans weren't deceived. They knew a Kaiju film when they saw one. As good as the Tri-Star film was, naming something Godzilla doesn't make it Godzilla. Perhaps you have to be Japanese to make a real Kaiju film. Perhaps you can make movies about the dangers of the A-bomb if your country actually had an A-bomb dropped on it. Or perhaps you have to be a fan of the genre. Or perhaps you are Jun Awazu, who's all three. Mr. Awazu had made two CGI monster movie send-ups before this one (both of them are on the DVD from Central Park Media). Negadon is obviously the crowning achievement. Set in the future, it features a creature unearthed by space developers on the planet Mars. This monster is accidentally unleashed on an unsuspecting Earth, delivering death and destruction with every blast of its energy weapons. Only one man can save us now. A disillusioned scientist who lost his only daughter in a lab disaster. He must pilot his experimental robot and fight the monster to the death. Yes, you've seen all these plot elements before. You've never seen them with spectacular CGI before. These effects are stylized in such a way that they will bring to mind the best moments of monster clashes gone by. Check out Jun Awazu's celebration of the 50th anniversary if Kaiju films. Negadon will blow you away. As kids, we watched this on channel 5 in NYC, it still shows up on the Sci-Fi channel from time to time. The big bonus with this release is the inclusion of a second disc — an audio CD of Akira Ifikube's incredible soundtrack. At a mere thirteen bucks, this DVD is a steal at any price. This is just one of those movies you can never get tired of. How could you go wrong with a selection of the very best of Godzilla music? this monstrously awesome CD is the original Toho scores, as created by talented composer Akira Ifukube, in all their mono glory! With a whopping 43 tracks of stuff, there's no shortage of music, and musical styles as the decades crawl past you while the Big Green Guy does his traditional Tokyo stomp. This harks back to the day of Saturday morning monster slugfests on TV. But what makes this CD extra special is the never to be topped "Mothra's Song," complete with lyrics for same (in THREE languages!) in the liner notes. This CD is a treasure trove of some of the finest movie music ever made - and you'll see where some Hollywood composers get their ideas! Just in time for Halloween! The original "monster movie", and the original Sci-Fi story, Frankenstein's monster is no stranger to anime. Many an anime and manga has seen an appearance of the infamous patchwork creature. (Tetsujin 28, for example, fought a very Frankenstein-style monster in its newest series.) There are anime movies in existence that have actually adapted Mary Shelley's famous novel. Face it folks, Frankenstein is everywhere. One of the best adaptations ever done was a two-part, three-hour TV movie first telecast on NBC back in 1973. Frankenstein: The True Story wasn't really faithful to the original novel despite what the title says. It did, however, sport a lavish production, an all-star cast, and a brilliant screenplay by celebrated writers Christopher Isherwood and Don Bachardy. Taking place in the late 1700s, Victor Frankenstein joins the insidious Dr. Henry Clerval in his quest to create life in the laboratory. Clerval succumbs to a heart condition, and Frankenstein continues without him. A really marvelous madlab scene (inspired by Universal's original movies with Boris Karloff) produces a Rocky Horror of a monster (Michael Sarrazin). All does not go well when the process reverses itself. While a degenerating monster ravages the countryside, Frankenstein tries to get it right in a second attempt. This time, he works with Clerval's rival, the even more insidious Dr. Polidori. A second really marvelous madlab scene (inspired by Hammer film's Frankenstein series with Peter Cushing) produces Prima, the Bride of Frankenstein (Jane Seymour in her first role). Murder, madness, and mayhem are served up in grand style. This movie was never available commercially, not in its original form. It's a welcome addition to any collection of the discerning classic horror fan. For those of you who don't like all that pesky plot and character development getting in the way of monster carnage - this is your movie. This is one of the best action-filled Godzilla movies! A startlingly long amount of the running time is devoted to a three way melee between Godzilla, Mothra, and Mechagodzilla, and it's some of the best monster action Toho has ever filmed — a battle scene that seems to take up 40% of the movie. Director Masaaki Tezuka really puts this movie into high gear. The sound and picture quality of this movie are outstanding. The special effects in this film are very well done! Kudos to the Asada FX team! The scenes with Kiryu and Godzilla are just breathtaking. If monsters bashing each other are your cup of tea, then Tokyo S.O.S. is the movie to own.